ԽՍՀՄ փոստային նամականիշ՝ նվիրված Ջուզեպպե Վերդիին, 1963 թ.
Պարահանդես-դիմակահանդես (Un ballo in maschera) - 1859. Ճակատագրի ուժը (La forza del destino) - 1862. ↑ 1,0 1,1 1,2 1,3 1,4 German National Library, Berlin State Library, Bavarian State Library et al. Record #118626523 // Gemeinsame Normdatei — 2012—2016. ↑ 10,0 10,1 10,2 Верди Джузеппе // Большая советская энциклопедия: [в 30 т.] / под ред. А. М. Прохоров — 3-е изд. — М.: Советская энциклопедия, 1969. ↑ Kimbell 1981, p. 92. ↑ Phillips-Matz 1993, p. 32. ↑ Phillips-Matz 1993, p. 46. ↑ Phillips-Matz 1993, pp. 27–30. ↑ Kimbell 1981, pp. 92, 96. ↑ Verdi to Clara Maffei, 12 May 1858, in Phillips-Matz, p. 379. He wrote: "From Nabucco, you may say, I have never had one hour of peace. Sixteen years in the galleys!" 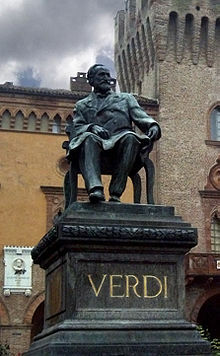 ↑ Parker, p. 82: He refers to 19th century writer Basevi's description as this begins Verdi's "second manner". ↑ Chusid, (Ed. ): Chusid notes that the eight operas of the "middle period" begin with this opera and end with Un ballo in maschera (1859). ↑ Phillips-Matz 1993, pp. 188–91. ↑ Gossett 2012, pp. 279–80. ↑ Phillips-Matz 1993, pp. 400–02. ↑ Rosselli 2000, pp. 138–39. ↑ Porter 1980, p. 655. ↑ Rosselli 2000, pp. 149–50. ↑ "Storia", Milan Conservatory website, accessed 27 June 2015. ↑ A number of photographs of these can be seen at the "Opera, My Love" website (accessed 27 June 2015). ↑ Giuseppe Verdi in IMDb website, accessed 27 June 2015. ↑ Verdi (1982) in IMDb website, accessed 27 June 2015. ↑ After Aida Archived 30 June 2015 at the Wayback Machine. production details at Robert Fox Ltd. website, accessed 27 June 2015. ↑ Risorgimento on website of Teatro Comunale di Bologna, accessed 27 June 2015. ↑ Operabase website, accessed 28 June 2015. ↑ See e.g. Opera Discography Encyclopedia website, accessed 28 June 2015. ↑ George Whitney Martin (1988). Aspects of Verdi. Limelight Editions. pp. 3–4. ↑ Mary Ann Smart, "How political were Verdi's operas? Metaphors of progress in the reception of I Lombardi alla prima crociata," Journal of Modern Italian Studies (2013) 18#2 pp. 190–204. ↑ James Bone, "Against Silvio Berlusconi's idea of culture", The Australian, 24 March 2011, accessed 28 June 2015. ↑ See "Va, pensiero", YouTube, accessed 28 June 2015. Бушен А., Рождение оперы. (Молодой Верди). Роман, M․, 1958.